Newegg is a well known ecommerce retailer that focuses on electronics. It boasts more than 28 million registered customers and regularly touts its industry leading customer service ratings. Like any ecommerce merchant it faces competition from the likes of Amazon and TigerDirect as well as from traditional brick and mortar retailers like Best Buy. There are a breadth of support options: phone, SMS text messaging, email, and starting yesterday (4/6/2016) Facebook Messenger, a live chat option delivered through instant messaging. 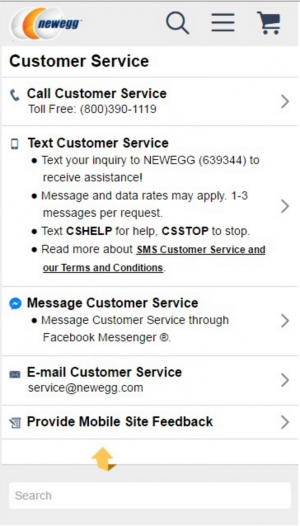 Newegg is among the first companies to pilot Messenger for Business by offering customer support via Facebook Messenger. Messenger is one of the most popular apps in the world with hundreds of millions of users. It’s simply smart mobile strategy to give customers the ability to engage with Newegg’s customer support representatives using an app that is already a part of their everyday lives. Newegg is displaying a mature approach to mobile strategy, one that doesn’t insist on customers downloading its own branded app. It’s a wise choice to meet customers where they are rather than push them to perform actions they are not interested in such as downloading yet another app. There’s definitely more Newegg can do – such as extending responsiveness past business hours using bots – but already they’re ahead of the curve.